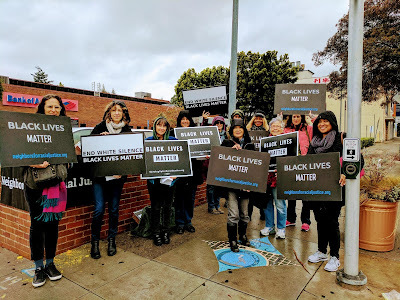 Neighbors for Racial Justice: Solid Rainy Day Vigil -- With New Faces! Solid Rainy Day Vigil -- With New Faces! Thanks to all who came out to our vigil today. It is always great to have brand new faces and perhaps even greater to have newer faces returning for the second or third time. In this time of frightening uncertainty for our future, it helps to come together and get filled up with the power of community.